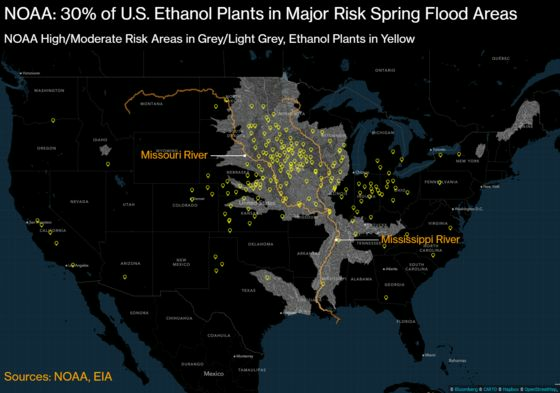 (Bloomberg) -- Flood waters spilling across the U.S. Midwest have swamped ethanol shipments, disrupting refineries and threatening to push up gasoline pump prices ahead of the summer driving season. Last week’s major winter storm sent the Missouri River and its tributaries over rail lines across the central U.S., interrupting deliveries of the corn-based biofuel and prompting trade group Growth Energy to ask Transportation Secretary Elaine Chao for help. “It is imperative that all possible actions be taken by the nation’s railroads to ensure that these critical fuel supplies are immediately prioritized and reach markets as quickly as possible,” the group wrote in its letter to Chao. On Friday, gasoline futures on the New York Mercantile Exchange reached the highest since October. The loss of ethanol -- which is blended with refinery-made fuel to meet environmental requirements in some parts of the country and to boost octane -- will further tighten supply that was already reduced by upsets at refineries from New Jersey to Texas to California. Ethanol reached a seven-month high on the Chicago Board of Trade. Fuel production is at a seasonal low as many refineries make repairs and upgrades before more Americans hit the road for vacations in summer. Multiple rail lines were washed out or under water in Missouri, Iowa and Nebraska, rail carrier BNSF said Wednesday. Union Pacific reported lines out in Nebraska, Iowa and Kansas. More adverse conditions loom. 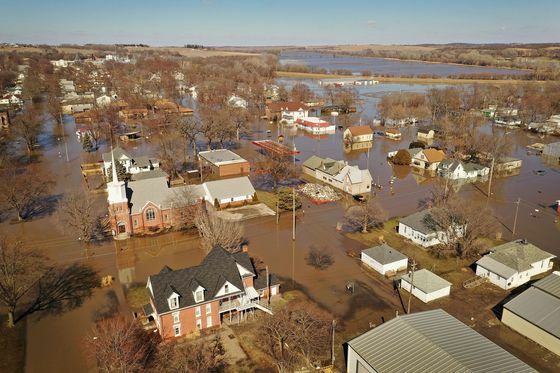 The National Weather Service said the U.S. is primed for record flooding through May as a deep snow pack across the Great Plains and Midwest melts onto ground left saturated by some of the wettest months on record. The U.S. had its third-wettest year in 2018 and the winter from December to February had the most precipitation in records going back to the 19th century, the weather service said. While each of Cargill Inc.’s three ethanol plants are operating, its mill in Blair, Nebraska is seeing rail challenges, said April Nelson, a company spokeswoman. Nebraska, the second-largest U.S. ethanol maker, was the hardest hit by the floods with 80 percent of its counties declaring emergencies. Flood waters are starting to recede in Nebraska along the Missouri and a round of weekend showers is expected to cause additional problems. Iowa Governor Kim Reynolds requested President Donald Trump to declare a major disaster in 57 Iowa counties due to flooding along the Missouri River and in other parts of the state. Iowa was seeking assistance for an estimated $1.6 billion in damages, including $214 million in damages to the agriculture industry, according to its Department of Agriculture. Pork producer Triumph Foods LLC evacuated workers and suspended operations at its hog processing plant in St. Joseph, Missouri, because of an unexpected rise in water levels on the Missouri River, Chris Clark, the communications manager, said in a statement. “We will be monitoring the changes in river level and information from authorities and hope to resume operations for Saturday,” Clark said. The plant has the capacity to slaughter more than 20,000 hogs daily, according to industry data.